Lughnasadh is the first of the three harvests celebrating grain and beer. It’s a time of celebrating abundance and giving gratitude for prosperity. Many honor Lugh, the Irish sun god, with games and offerings. At the beginning of August, sunflowers and corn are both ripe in the garden. 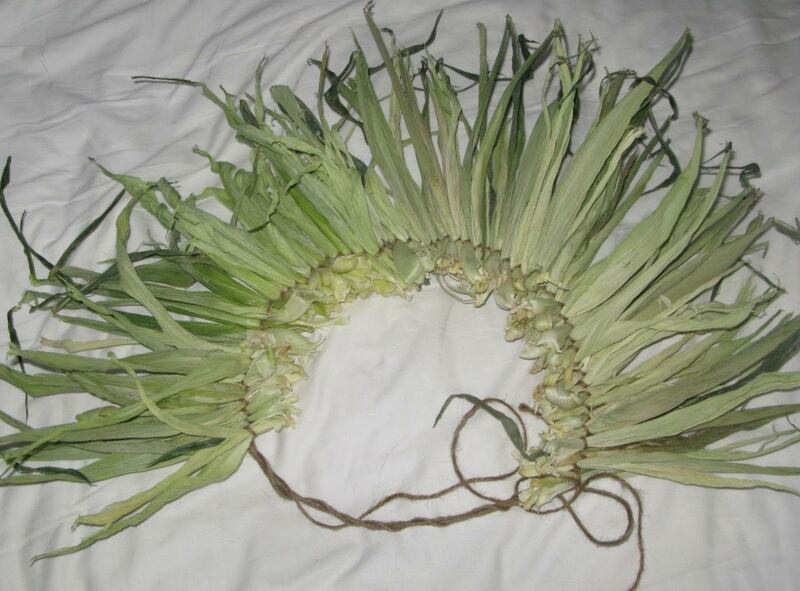 This thrifty craft combines both symbols of the sabbat in a wreath that will last for many harvests to come. Save all the husks from about a dozen ears of corn. If you decide to make this a group project, try asking for the contents of the barrels often set up next to the corn display at farmers markets and grocery stores into which customers drop husks after removing them when inspecting ears before purchase. Spread them out so they can dry. You can work with them somewhat or completely dried. Buy or make a round frame the size you want your wreath. A wire hanger bent into a circle is one possibility. I used coated wire, but grapevines twisted together are other options for the frame. Knot one end of a long piece of twine to the frame. Take the first husk and place it on the wreath next to the twine at a 45-degree angle with about 1 1/2 inches extending into the center of the circle. Wrap the twine around the husk and under the wire. Now, place the second husk next to the first. 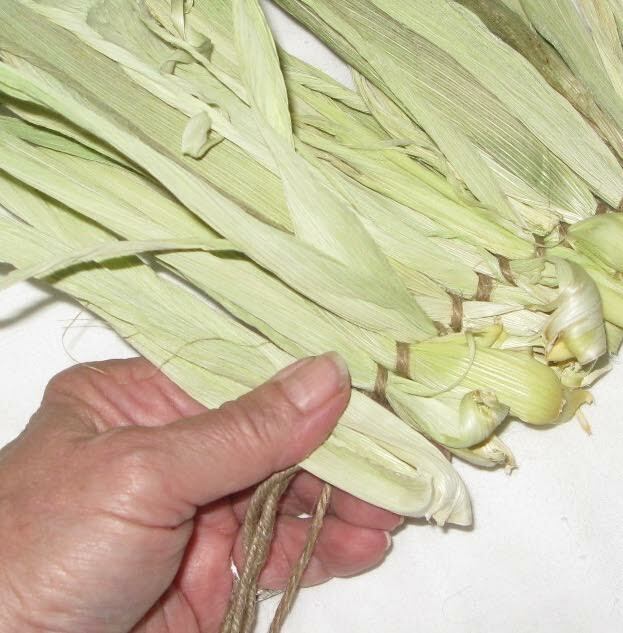 Bring the twine up from below the wire and over the top of the second cornhusk, then pass it back down over the wire between the last cornhusk and the one before it. Continue in the same manner, keeping the twine tight and the husks as close together as possible. This is the back side of the wreath. A spool of wire can be used instead of the twine, passing the spool up, over the husk and under the frame. 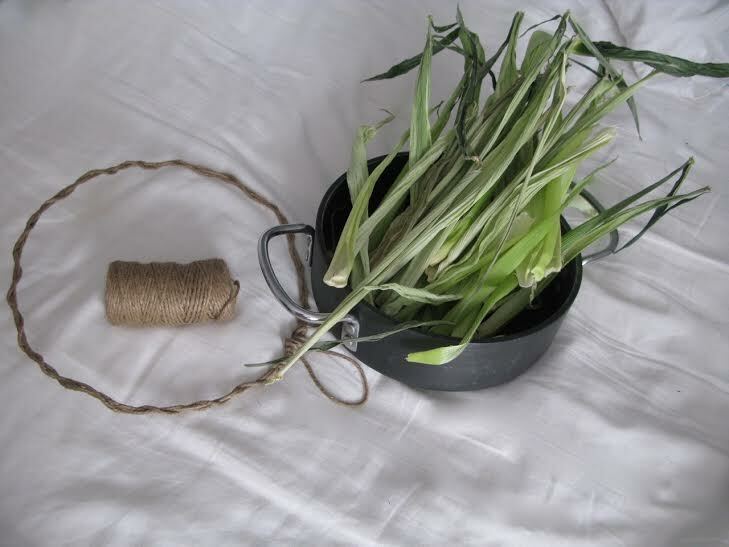 When finished, tie off the twine and fasten a loop for a hook. If desired, add pinecones to the middle to look like the seeds in the center of a sunflower. Turn the wreath to the front and wedge in or glue – beginning along the outer edge and working your way to the center. 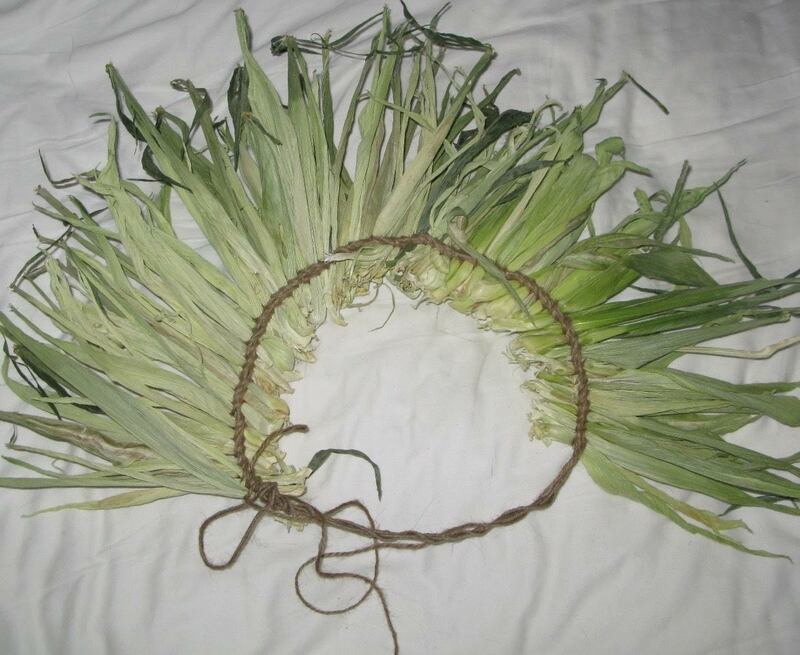 Another option for making a wreath is to start with an eight-inch straw wreath. 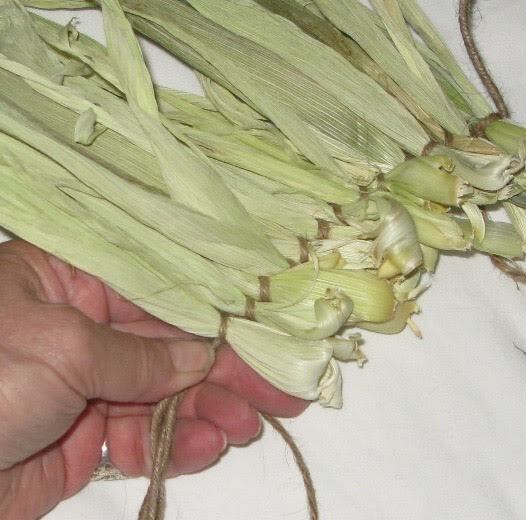 Working with fully dried husks, take one at a time and put hot glue on the bottom half of the inside. Wrap it around the form, beginning in the back and bringing the husk over the top, securing with a dot of glue. Repeat, moving around the circle until the desired coverage and fullness is reached. Consider blessing it during your sabbat celebration, and perhaps hanging it above your altar before hanging in in a window or on a door.